We haven't had many games that support multiple parties adventuring at the same time, and each has handled the notion a slightly different way, depending on the reasons for the separation. 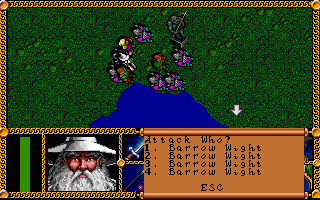 For instance, some games support multiple players operating simultaneously, either cooperatively or competitively, such as the Stuart Smith titles, Swords of Glass (1986), and Bloodwych (1989). 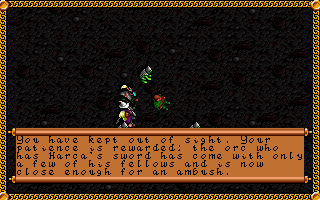 In contrast, Ultima VI's ability to send an individual party member off on his own was more a matter of expedience in exploration and combat. In some games, you need multiple independent parties to solve puzzles--a dynamic we saw in The Magic Candle (1989) and Fate: Gates of Dawn (1991) . The Two Towers is the first game to require multiple parties solely for fidelity to the narrative. It is also the first in which parties, by design, can never meet. They can't swap equipment, can't help each other out, can't arrange party members in the ways that makes the most sense given the nature of the area and the enemies that they face. I realize why this had to happen to preserve the link to the source material, but given the number of narrative fancies the game manages to introduce within each section, one wonders why they couldn't have taken the same laissez-faire attitude to the story as a whole. Frodo's "lore" skill comes through. When I started the game, I thought that the action would switch only between two parties: Aragorn's and Frodo's. It turns out there are three. The game actually found enough for Merry and Pippin to do in Fangorn Forest (most of it non-canonical, of course). Three parties is too much to juggle. Maybe it changes later, but playing the game in its first few sessions is like playing three separate games with the same engine, and no control over switching among them. The game's abrupt and arbitrary movement among the parties makes it easy to forget what one party was doing before it was so rudely interrupted. I'm not enjoying that aspect. The last session had ended when the action abruptly left Aragorn, Gimli, and Legolas and cut to Frodo and Sam, on the other side of the river that I originally thought was the Isen but now know to be the Anduin. Knowing that I had to eventually go south into the Dead Marshes, I began exploring in east-west strips between the river to the west and some mountains to the east. Gollum meekly joins the party. The area was quite wide. I had to climb down several tiers of cliffs (using the "Climb" skill) in the opening stages. In between two sets of cliffs, I ran into Gollum. I expected some sound and fury from the encounter, but instead a simple use of the elven rope enlisted him into the party. There were no heated words from Sam. In general, party members in this game don't speak to each other very much, which of course is a notable change from the original story. At the base of the cliffs, we found a small hut with a hostile man named Beredu inside. He yelled us not to enter, then yelled at us when we entered anyway, then attacked us when we didn't leave. We killed him. He had nothing. It didn't seem like an encounter that was supposed to go that way, but I've decided to just roll with everything in this game. 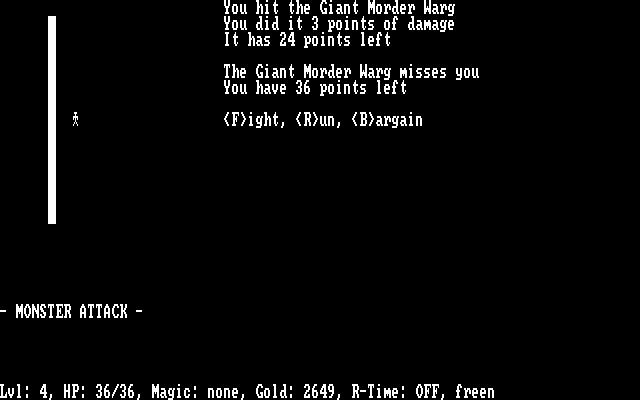 Gollum, you may be strong and crafty, but don't go up against the completionist tendencies of the computer RPG player. You'll lose every time. Moving on, we came to a three-story structure that turned out to be owned by a vampire. The attic offered combat with some bats and nothing else. The main floor had a room with a bubbling cauldron where we freed some souls and got a casting of ELBERETH in return. The basement had four sarcophaguses, one of which held a spirit that asked me for the Star Ruby of Gondor, which he said I'd find in a sinkhole out in the marshes. In the middle of the room was an obelisk that sucked us in to an area of darkness, and the vampire attacked. 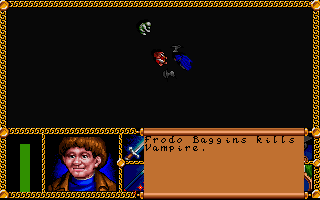 I wouldn't have thought two hobbits and Gollum would be very effective against a vampire, but we killed him in a few rounds. Does Frodo canonically kill anything in the books? I don't think he does in the films. 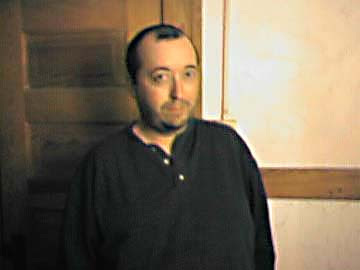 Afterward, we found an elf named Gilglin lurking around the corner of the basement, overcome with ennui. I can't remember exactly what I did to rouse him--I remember running through all my skills--but he eventually livened up and joined the party. I assume he's original to the game. The newly-bolstered party had just wandered out the front door of the vampire's keep and started wading through the marshes when action suddenly shifted to Merry and Pippin in Fangorn Forest. Fangorn was a large maze. We soon encountered an Ent named Longroot who offered to take us around. When we asked about Treebeard (which I guess was a bit of a cheat), Longroot offered to take us to him, and we accepted. Treebeard had a bit of introductory dialogue before he took us to some part of the forest called Wellinghall. When we spoke to him about Saruman, he agreed that the wizard must be stopped and summoned the Entmoot. Part of the maze of Fangorn. The game gave us the option to wait around for the Ents to come to their decision or explore the forest. I decided to explore. Treebeard warned us about evil living trees called "huorns," but he said they'd leave us alone if we had an Ent in the party, and he gave us one of the "hastier" Ents, called Quickbeam. (The adorable little icon looks more like Baby Groot than the Ents from the flms.) As we explored the forest, we had repeated notes that Quickbeam's presence kept huorns and perhaps other creatures from attacking. It didn't stop anything else from attacking, though. For a fairly weak party, Merry and Pippin were assailed far more than the two previous groups, mostly by orcs and uruks, and soon their health was at the minimum. Fortunately, Quickbeam had strong attacks and a lot of hit points, and I was able to use him as a tank in most encounters. The health system hasn't changed since Vol. I, and it's a bit weird. While there are some items that provide minor amounts of healing (e.g., eating rations restores a couple of hit points), healing occurs more often by plot point than by player choice. The initial pool of hit points is expected to last for long intervals. Characters get knocked unconscious if their hit points drop below 6, after which they lose 1 hit point per round until they die or combat is over. But if they don't die, they "wake up" with 6 hit points and are good to go. For a lot of Merry and Pippin's session, they remained on the edge like this, lasting only a couple of rounds at the beginnings of combats, but waking up slightly healed after Quickbeam had wrapped things up. 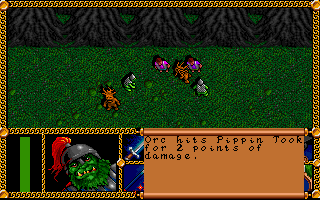 In battle with some orcs. There were a lot of side areas and side-quests in Fangorn. One confusing questline seemed to ask the party to find the source of the "Entwash," a river that runs to the south of Fangorn and feeds into the Anduin. Some of the Ents I found were inert, and I needed water from the Entwash to revive them. 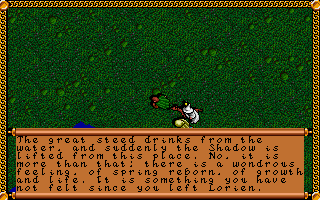 I also needed Entwash water to hydrate a small seed that an elven ghost (Linandel, if that means anything to you fans) wanted me to plant somewhere. In any event, while exploring I ran into an Ent guarding a cache of Entwash water, so I think the whole business about finding the source turned moot. The forest was full of (I suspect) non-canonical Ents--Greenroot, Longroot, Skinbark, Leaflock--who provided a variety of hints. I rescued some of them from orcs, who had apparently been tasked by Saruman to chop down as many trees as possible. Eventually, one of them joined us--a young Ent named Twiglate who we saved from a forest fire. That was late in the session, though; I could have used him a lot earlier. And the two hobbits will survive a few more battles. On the west side of Fangorn, we found an orc encampment of several buildings and multiple battles. Merry and Pippin got some chainmail and shields (they had started with just barrow daggers), so that helped a bit. On the north side of the camp, a tunnel went into the mountains and we found ourselves in a fairly large dungeon. I probably need to cover it more next time because I don't think I fully finished it this time. The opening room had some large trees, "parched husks," that we're clearly meant to do something with, but the obvious solutions (such as giving them water) don't work. There's also a large obelisk that I can't figure out anything to do with and a silver door that I can't open. Saruman has parties of orcs everywhere trying to find us, and we're in his basement stealing his tobacco. Past the obelisk, a tunnel took us to an adjacent cellar full of storerooms with rations and pipeweed and other supplies. Emerging up from this cellar, we were surprised to find ourselves on the main level of Isengard, and two difficult battles with uruks and Dunlendings. Clearly, we were extremely far afield at this point, so it was a slight mercy when, while exploring the edges of the area, the game intervened to tell us we'd gone too far, and warped us back to Fangorn. So "free will" isn't much of a thing in this setting, huh? Merry and Pippin's session ended when we returned to the Entmoot. Treebeard told us that a couple of Ents hadn't shown up and asked us to go rouse them. I suspect they both need Entwash water, and I'm pretty sure I already hydrated one of them. Treebeard also gave us a "spell" of sorts that would summon Ents to help us in combat, something we really could have used for the bulk of this session. 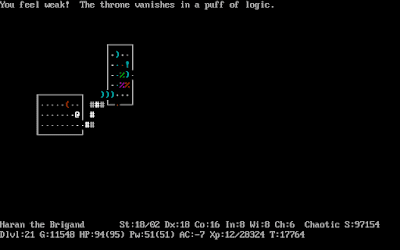 (Perhaps I was meant to wait out the Entmoot rather than explore while it was deliberating.) Anyway, the game didn't give me a chance to find the Ents or try out the new spell. It abruptly returned the focus to Aragorn's party instead. My time with Aragorn his group--which included the recovered Gandalf--was mostly spent cleaning up quests discovered in the first session. The primary one was to satisfy the "weregild" set by the survivors of the ruined town of Estemnet. The leader of the town had wanted me to find her husband's sword, her son, and a bag of gold stolen from the town. The latter two were both found on the edges of Fangorn on the north side of the map. In one clearing, I found the "youth" (although he's depicted as a middle-aged man with a mustache), Harding, fighting orcs alongside a woman named Folwyn. We helped them out and they joined the party. The bag of gold was in another clearing. 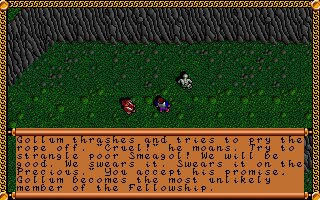 I suppose that if we were role-playing an "evil" fellowship, we could have just watched him die. The main orc encampment was in the middle of a burned section of forest. Every time I entered, the game told me that there were too many of them and gave me a chance to take about one action before they attacked and we met a scripted ending. I attempted various skills during that brief pause and finally hit the solution with "Sneak." This caused the main body of orcs to drain away, and we were able to set an ambush for the remaining ones. When the dust cleared, we found the sword on the leader's body. I just don't understand why one character's "Sneak" skill can hide the entire party. Harding and Folwyn left us when we returned to Estemnet and delivered the items. The leader, Leofyn, promised that the survivors would try to clear orcs from the land. I'm not sure what that does for me, but perhaps it results in fewer random encounters. You're a glass-half-empty sort of woman, aren't you? Next, we solved the puzzle of the corrupted mearas pool by attacking the orcs' altar at night, releasing a bunch of barrow wights, and killing them. Nearby, a local resident named Heof told us that to finish purifying the pool, we would need to get one of the mearas to drink from it. I don't know why Gandalf is incapable of summoning Shadowfax at the moment, but our solution was to find one to the southeast of the pool and lead him to the pool. "...which, admittedly, wasn't that long ago." 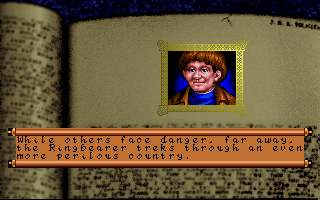 At that point, before we could even take steps towards Edoras and the next stage of our quest, the game yanked us back to Frodo, Sam, Gollum, and Gilglin, who I hope is non-canonical because his name sounds a lot like "Gilligan." We're back with the Ringbearer. But for how long? Aside from all the chain-jerking between parties, the one thing that really annoys me about this game is that despite decent graphics, it fails to visually depict important environmental features. It tells us about a tunnel into the mountains rather than showing us. We wander into what looks like an empty building but suddenly get a message that there are orcs all around us (and then, of course, they visually appear just in time for combat). The evil altar on the north side of the mearas pond doesn't appear until we first get a message telling us about it. NPCs show up suddenly in the middle of blank grassland. Too much, in short, depends on the party deciding to walk into what otherwise looks like empty areas, rather than seeing something interesting graphically and saying, "Hey, let's go check that out." How did we get this far into the building before noticing a "group of angry orcs"? Neither that shrine nor those wights were visible until we walked upon the right set of pixels. But it's early, and the game may yet have some surprises. I look forward to seeing how it handles certain plot elements while also wondering how it justifies, say, the ability to freely explore Isengard. The party continues to explore The Seventh Link's large world. This entry posits a thesis that I've never explicitly articulated before and probably haven't spent enough time thinking about its flaws. I thus particularly invite you to join me in the comments and add or modify the thesis's tenets. It doesn't feel to me like a particularly original argument, so I'd also be glad for any references to other writers who have argued something similar. The thesis is that a perfect game (although this might apply to films and novels, too) is something like a cube--equal and balanced on three dimensions. I am calling those dimensions breadth, depth, and immersion. 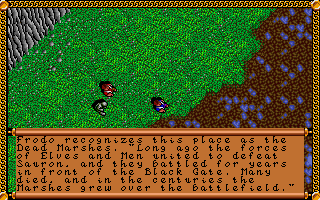 Fate: Gates of Dawn (1991) had an enormous game world and not enough happening within it. Breadth refers primarily to the physical size of the game. It can be measured in dungeon squares or tiles, or in modern games the length of time it takes to travel from one end to the other. It also refers to the length of time it takes to play and win the game; while this is often a function of size, it can also be manipulated to make a small game seem larger or a large game seem smaller; for instance, in the use of fast travel (making a large game seem smaller) or the re-use of maps (making a small game seem larger). Depth refers to the things that you find and to the things that happen within that game world. 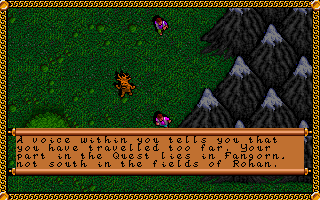 The specific elements depend on the game's genre, but for RPGs it includes things like the backstory, lore, NPCs, quests, and character development. Two separate multi-volume book series covering the biography of a single NPC might be too much for some games--but not for The Elder Scrolls' huge game world. We'll get to immersion in a minute, but for now let's pretend that my thesis has only these two elements, and I'm arguing that a good game is like a square: you want a breadth equal to its depth and vice versa. The easiest way to engage the thesis is to imagine the extremes. A game with extreme breadth and almost no depth would be something like Red Dead Redemption 2 or Fallout 4 if all you could do was explore the map. You'd get bored pretty fast. The opposite--a game with extreme depth and no breadth--is harder to envision because it almost wouldn't be a computer game at all. Imagine a game of only a couple of dozen squares in which every time your character moves, you have to read paragraph after paragraph of text and engage in hours-long dialogues with multiple NPCs. The computer part would feel superfluous. The Star Saga games are the closest I can imagine in real life. 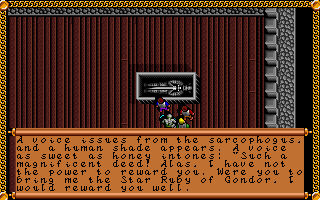 Star Saga (1987) mostly used the computer application to direct "players" to chapters in a several hundred-page book. My thesis is that a good game doesn't have to feature a lot of breadth or depth, but rather than it needs to keep them in balance. It is thus not absurd to argue that Ultima IV is a better game than Dragon Age: Inquisition even though the latter is bigger and has far more story and lore. The issue isn't which has more but which does a better job balancing the two. 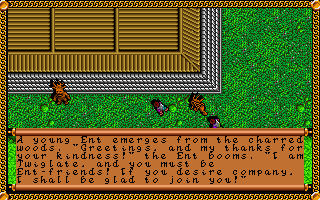 Ultima IV has just enough backstory and in-game dialogue, lore, and other content to support the size of Britannia and the length of the game. 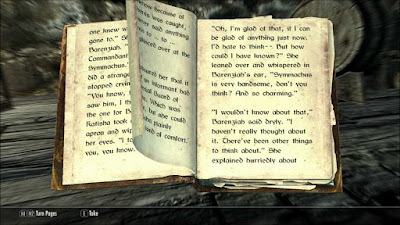 If had featured 200 books with as much text as those found in The Elder Scrolls, it would have gone too far. It would also have gone too far if it had featured the same content as it does, but in a world four times the size. I have seen the phrase "wide as an ocean, deep as a puddle" applied numerous times to Skyrim. I find it unfair, but only a little. I'd say that it's as wide as the Pacific Ocean but deep as the Arctic Ocean. The game has plenty of depth. It would be insane to argue that it has less depth (e.g., less content, less meaningful NPC interaction, fewer choices, less role-playing) than fan favorites like Dungeon Master, any of the Ultima titles, or even Planescape: Torment. But people aren't objecting to its absolute depth; they're objecting to its depth relative to its breadth. When I say a game is "too long" in my GIMLET, I'm not saying that crossed some objective threshold so much as I'm saying that it's too long for its content. 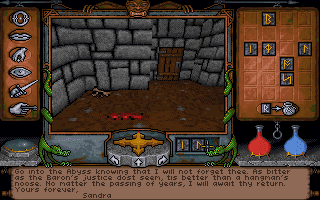 Ultima Underworld (1992), through a combination of graphics, sound, and interface, is one of the first games to make you feel truly "immersed" in the setting. Let's talk about the third axis. I debated for a while about including it, but I do think it's important. Immersion deals with the game's capacity to make you feel like you are truly "occupying" its world, and it's primarily a function of graphics and sound--although we must allow for skilled developers who can engage the player's imagination in the absence of these things, as a good author does. To understand the importance of this axis, imagine a large game that you believe balances breadth and depth well. Fallout: New Vegas seems to be a fan favorite. Now imagine that it has no sound and the wireframe graphics of Wizardry. Is it still on your top 10 list? No matter how well a game balances size and content, there's a point at which it becomes "too much" if it can't fully engage your senses and immerse you in its world. None of these variables is completely objective, and immersion is probably the least objective of the three. Its importance has a lot to do with your age and experience level with older games. I still think the graphics in Morrowind are beautiful, but last week, I stumbled on a Reddit thread in which someone posted an image of a horse falling over in Red Dead Redemption 2 and leaving a horse-sized imprint in the mud, and half the commenters were complaining that the imprint wasn't realistic enough. Even among those of us with a high tolerance for primitive graphics, immersion is a mutable characteristic. A game that seems like a solid cube today will slowly flatten as we become used to better graphics and sound. 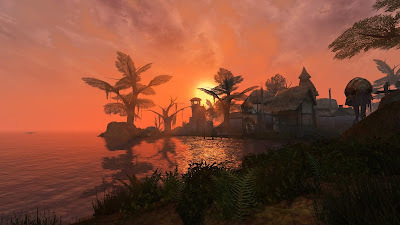 Watching the sunset in Morrowind (2003) still seems lovely to me, but to some people these graphics are hopelessly outdated. The greatest developmental sins are committed by RPG authors who fail to consider these elements of balance. Take Fate: Gates of Dawn, which took me 272 hours to win and featured both an enormous outdoor game world as well as enormous, multi-leveled dungeons. It was a game of ridiculous breadth, and while it had a certain amount of depth--perhaps even more than the typical RPG of the time--it didn't have enough depth to equal the breadth. I still recommend that modern players limit themselves to the opening area and the Cavetrain quest, as those first 50 hours let you experience everything good about the game; the remaining 5/6 of its length is utterly superfluous. 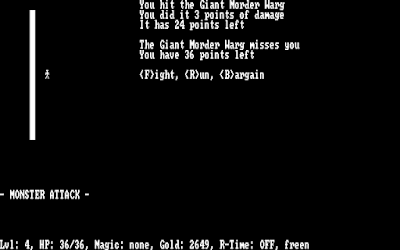 Knights of Legend, Wizardry V, and all three Bard's Tale games are all good examples of games whose size greatly exceed the amount of interesting content they provide. It's tough to find reverse examples--too much depth and not enough breadth. 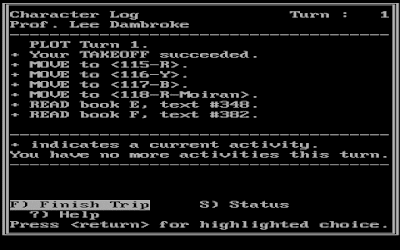 I mentioned the Star Saga games earlier, in which you make a move in a computer application and then read pages of text in an accompanying book. I ended up rejecting them not because they weren't RPGs because they weren't really computer games. There are other examples of games that wanted to do something epic with their themes but struggled with an interface that could support their intentions. ICON: Quest for the Ring is a good example. The three Richard Seaborne games--particularly Escape from Hell and The Tower of Myraglen--had deep philosophical ambitions that weren't quite matched by the gameplay experience. 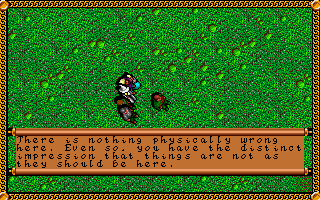 The Tower of Myraglen (1987) wanted to be more profound than the breadth of the game could really support. But even games near-perfectly balanced in depth and breadth often suffer when we consider the immersion axis. I will grant you that there's a somewhat high threshold before it becomes important. It arguably never becomes important in simple arcade games, and even with RPGs, anyone who argues that Wizardry or Ultima or Dungeons of Daggorath are bad games because of their graphics is expressing an opinion so out-of-touch with my own values that I'd almost regard it as a character flaw. But even I would argue there's no place for a soundless wireframe game that takes 200 hours. There is a degree to which good descriptive text can substitute for graphics, which is why I often praise games for including it, but even I would probably balk at an all-text Fallout 4. Deathlord is a good example of a game that's reasonably square with breadth and depth but still largely fails because it's just too big for an iconographic game. I think we're going to start to see this a lot more with 1990s titles, as the use of hard disk installations allows for physically enormous games that are still a bore to explore. The first Elder Scrolls title, Arena, will probably be an example. Most people probably wouldn't argue that a game's graphics and sound are too good for its breadth and depth, but there are times that you feel that the developer's wasted immersive engines on limited content. Myst is arguably a good example, if you don't love its type of puzzles. 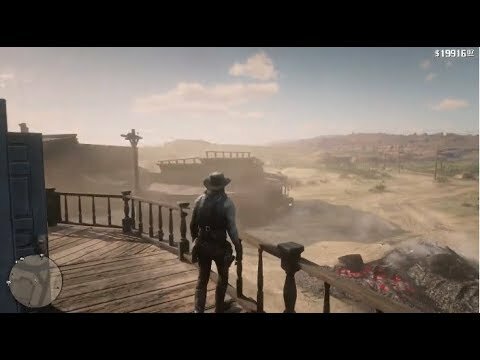 Eventually, we reach a point at which depth and immersion almost merge--where the graphics and sound are so good that they let you see, hear, and otherwise experience things that would otherwise have to be rendered as dialogue or written text--and that has implications for this thesis that I haven't fully considered. Fully half of Red Dead Redemption 2's game map exists mostly to look nice, with no significant gameplay content. This thesis gelled as I play The Seventh Link. If you haven't been paying attention, developer Jeff Noyle paid a visit in the comments to my last entry and offered some tips and maps, which motivated me to keep going with the title. The game is mechanically sound: Noyle did a good job replicating the basic experience of Ultima III and IV, including combat, while arguably improving the economy and inventory system. The problem is a reduction in content accompanied by an increase in size. Elira alone--let alone the three other planets--is as large as Britannia (from Ultima IV), has almost as many towns and dungeons, and its towns and dungeons are larger. And yet in the entire game, there is less dialogue than a single Britannian town. 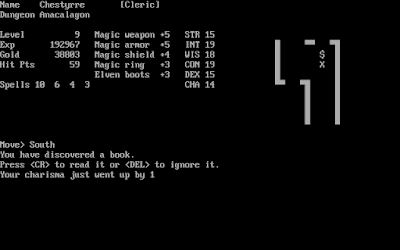 While an Ultima player has lots of side-quests and sub-quests to accomplish (find the mystics, find the runes, learn the words of power, meditate at shrines, etc. 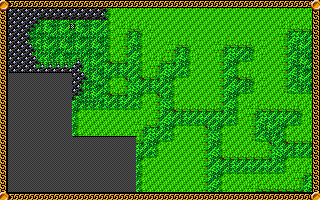 ), the Seventh Link player has a much simpler quest with fewer stages. In short, the game's breadth far exceeds its depth. When I last blogged about the game, I had explored a couple of dungeon levels but was worried about overextending myself. I think the developer intended a larger, stronger party before tackling the dungeons. Back on the surface, I soon encounter what I most needed: a pirate ship. After slaying the pirates in combat, I was able to board the ship. Blasting enemies with the ship's cannon. 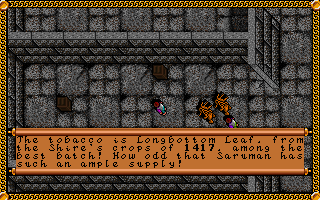 As in Ultima III-V, the ship has cannons that can be used to mercilessly wipe out approaching enemies, but doing so offers no experience or gold. They're best used to eliminate enemies you don't want (e.g., anything that causes poison) so you can spend your hit points and spell points on easier and more lucrative prospects. I used the boat to reach previously-inaccessible land areas and thus visit a few more towns. In one of them, I got a third character, a cleric named Tharon. One of the towns sold a "flying disk," but it's a bit above my price range. I need it to continue exploring the town, although I don't know if you can take it with you when you leave. A second NPC joins the party. There are some interesting graphical vignettes in the outdoor area, including doors in the middle of mountain ranges, archipelagos connected by bridges, towns at the end of mazes, towns with lakes in the middle of them, and so on, but none of this interesting geography leads to any depth in gameplay. 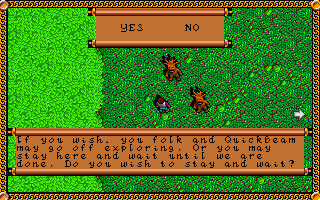 The towns have the same identical services and one or two lines each of useful dialogue. This makes the land somewhat exhausting to explore, which is why I'm now using the maps that Jeff provided with no shame. An interesting environment, and yet the town has no more depth or character than any other town. I'm going to make a push to win this in one or two more entries, before I get started with Star Control II, which will require a large devotion of time this weekend. The final thing I'll say about breadth, depth, and immersion is that my GIMLET doesn't reflect them very well. The considerations aren't entirely absent, but the GIMLET definitely rewards more of everything rather than good balance among the three axes. So far, it hasn't been a huge problem, but I think it will become one as time marches on. Mediocre games from the 2000s will end up getting much higher scores than excellent classics just because they have more of everything--more NPCs, more character options, more history and lore, better graphics and sound, and so forth. I'm concerned that the GIMLET's purely additive system will result in relative scores that I balk at, like Might and Magic IX ranked higher than Might and Magic III or a bore-fest like Kingdoms of Amalur outperforming Pool of Radiance. I don't have the answers to this conundrum yet, but sometime this year we'll have a discussion about potential revisions to the GIMLET that better take these factors (and others) into account. This would be a good time to start organizing your arguments. I thought I would centralize, in this entry, all of the games that we either can't find or that I've found unplayable or unwinnable in some mysterious way. This should make it easier for readers who stumble across the blog to offer hints. I'll remove titles (or otherwise flag them) when we find solutions and add titles as I verify their "missing" and "NP" status. I appreciate any leads, but please do not take it upon yourself to reach out to the original developers unless you somehow know them personally. Chances are, I've already tried to contact the most promising leads, and I don't want the authors (or people with their names) to get repeated contacts. If you feel you have a promising lead I may have overlooked, please verify with me first. Bugs 'N Drugs (1977, PLATO). An early game of the DND lineage. The lesson name was BND. It isn't part of the lessons catalogued on Cyber1. Castle of Tharoggad (1988, Tandy Color Computer 3). Nothing seems to happen upon reaching top floor and killing monsters. See this entry. 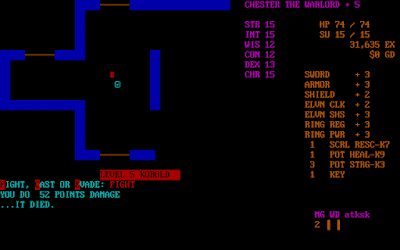 Dungeon (1975, PDP-10). This game by Don Daglow no longer seems to exist. See this Wikipedia article. Dungeons of Avalon (1991, Amiga). Culminates in seemingly unwinnable final battle. If you cheat your characters to high enough values to win the final battle, nothing happens. See posts here and here. Empire III: Armageddon (1983, Apple II). No one seems to have turned up a disk image. 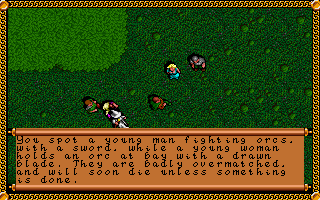 GayBlade (1992, DOS). Famous lost RPG with LGBTQ themes. Some of my commenters were pursuing some leads, but that was weeks ago, and nothing seems to have turned up. Reviews, box art, and various commentary prove that the game existed, but no one seems to have a copy. See here for more. m199h (1975, PLATO). 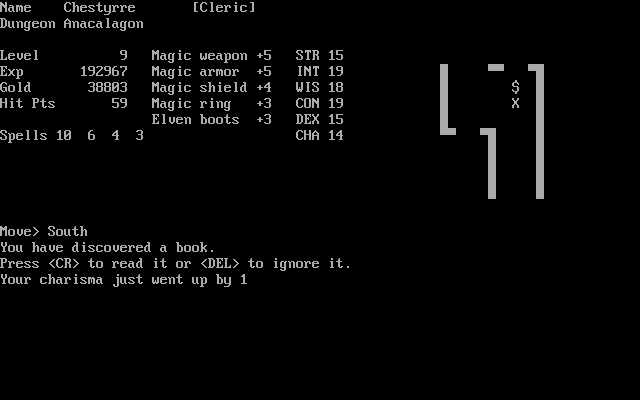 Perhaps the first CRPG ever written, deleted by PLATO admins. 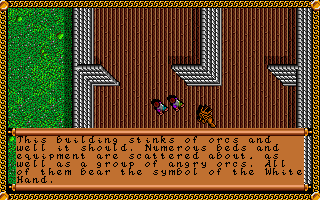 OrbQuest: The Search for Seven Wards (1986, Macintosh). I've been unable to find a place to download this first Mac-only RPG. 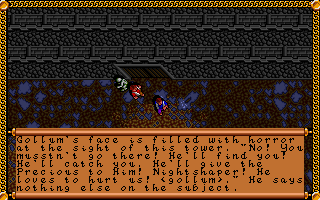 Seven Horror's (1988, Atari ST). Read my entry for the full experience. 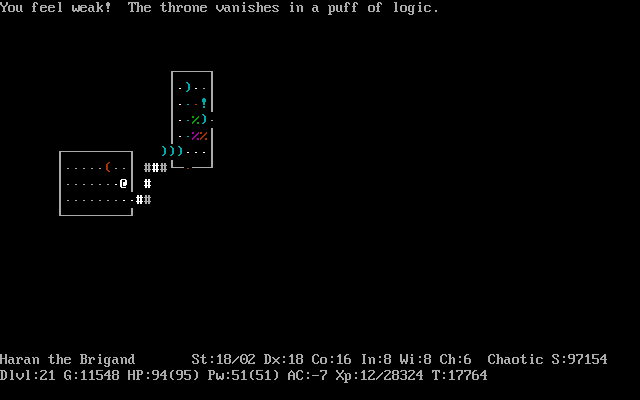 I assembled the seven artifacts I was to find, and got a three-part code word, but never found the key for the final dungeon. I lacked documentation on the game in general and was never sure what I was doing. Star Crystal: Episode 1 - Mertactor: The Volentine Gambit (1985, Apple II). It seems that this game was never officially released. Edit: Solved in the comments! TaskMaker (1989, Macintosh). I've been unable to find a copy of the original version, just the color remake from 1991. 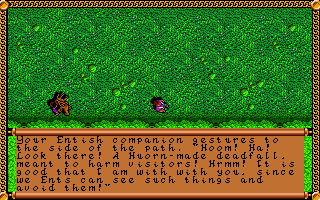 Twin Morg Valley (Unknown, Commodore 64). See the bottom of this entry. We still don't know when this was released or what its "deal" is.